The excitement of diving into the sea was almost childlike, as I had waited for five anxious days undergoing academics and ‘confined water training’, a requirement of the world-renowned Professional Association of Dive Instructors (PADI). Instructors at Indus Scuba, the first Karachi-based licensee of PADI (and a licensee of National Association of Underwater Instructors, NAUI) had stringently grilled me with quizzes after I had gone through the ‘knowledge pack’ issued earlier. If truth be told, I had waited not just five days, but it had actually been over five decades that I had been swimming in the pools (and many years flying over the sea), waiting for a chance to ‘go down and deep’. 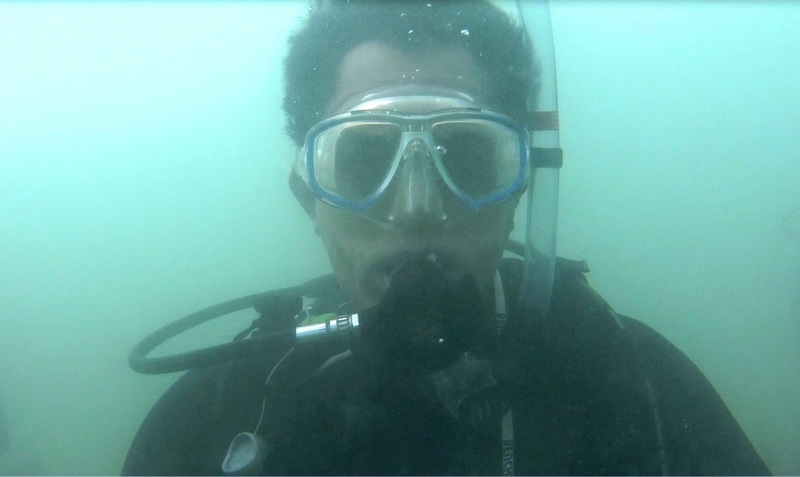 Now I was going to dive with the Self Contained Underwater Breathing Apparatus, off tiny Churna Island, an hour’s boat ride from the waterfront at Manjar village located on the Hub River delta. To get to Manjar village, or the more exotic sounding Sunehra Beach, which is about 40 km from Keamari Harbour, we had to wend our way through crazy traffic, with motorcyclists and vans vying for space with trucks, the latter having a complete hold over the roads. Wayside dhabas offer tea and desi food to weekend visitors like us, and to their regular clients, the truckers. As we proceeded further west, we had to endure a forlorn landscape blighted by litter, plastic bags and pye-dogs. The Karachi politicos and municipal staff never seemed to have paid attention to this sparsely populated area. Fisherfolk’s villages or goths, interspersed all over the area, are bereft of any civic amenity whatsoever, as they have been for centuries. Tourism, as in the rest of the country, seems to be on permanent hold. It was a wonder that a serious recreational sport like scuba diving was still on. Nearing Manjar village, we could see the mouth of Hub River forming a well-sheltered cove, which has a small fish harbour with scores of boats anchored on the coast. Absent from view were the bare necessities or infrastructure expected at even the smallest of ports. Hub Power Station is just 3-km away, across Hub River, which marks the boundary between Sindh and Baluchistan. I was particularly intrigued by the fish harbour, as history books mention a small thriving port by the name of Kharak Bandar, ‘at the confluence of Hub River and the Arabian Sea’. Silting of this harbour led the Hindu merchants to abandon the locality, and resettle in Kolachi-jo-goth in 1729. A small fishing village with a few potable watering holes, Kolachi grew into the maritime trade megapolis of today. When we arrived at the Sunehra Beach, a couple of modest resorts came into view, along with some private boats and water scooters parked ashore. Merry-makers started to throng the place in sizeable numbers in no time. Our group of divers also arrived in small batches, and soon after, we started to load one of the hired boats with diving gear. The divers broke up in groups and boarded two more boats whose noisy motors puttered into action, and we were on our way to Churna Island. The sea was somewhat choppy, as the diving season, which lasts from September to March in the north Arabian Sea, was coming to an end. Mustafa Hassan, a highly rated Master Scuba Dive Instructor with over 1,000 dives to his credit, was in charge of the day’s outing. The svelte Nameera Ahmed, a film-maker and freelance Dive Master with an experience of about 100 dives, was also at hand to train a group of intrepid girls who had taken on the scuba challenge. Arriving at Churna Island an hour later, the boats were anchored, and the waters tested. On getting an all clear from Mustafa, everyone donned the scuba kits, with dive buddies checking each other’s equipment for any faults. Diving is always done in pairs to make sure help is available in case of equipment malfunction, or some troublesome medical condition cropping up. Scuba diving is strictly for the medically fit people, especially on the cardio-vascular side. This aspect cannot be taken lightly because when you are deep down, you are under extreme physical pressure, causing nitrogen in the body to force its way into unwanted cavities and tissues. As we readied ourselves to take the plunge, I imagined myself exuding the mystique of the speargun-wielding James Bond in Thunderball, a thrilling scuba flick that I had watched as a teenager. One by one, our diving pairs did the ‘roll backs’ from the sides of the boats, checked their breathing systems, and vanished with nothing but a trail of short-lived bubbles. The visibility was not too good because of sediments kicked up by freak winds and currents over the past two days. 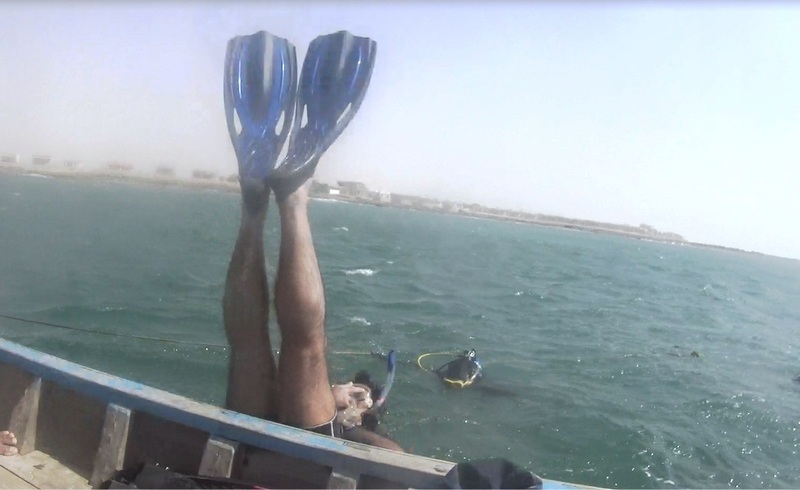 Nonetheless, my instructor and dive buddy Mustafa and I, were able to exchange hand signals with ease. I did the mandatory ‘nose pinch and blow’, for equalisation of pressure in the middle ear, without which a descent can get very painful. I was quite comfortable while going down, and was also spared the claustrophobia and disorientation that sometimes afflicts first-timers. My only concern was the stinging jellyfish, as my ‘shorty’ wetsuit left the arms and legs bare. Luckily, it was off-season for these critters, though they are known to invade warm tropical seas in astronomical numbers at odd times, as they did last December. Arabian Sea is a haven for several species of whales including the baleen and toothed types. These are harmless, as long as one isn’t whacked by their gargantuan fins, that is! 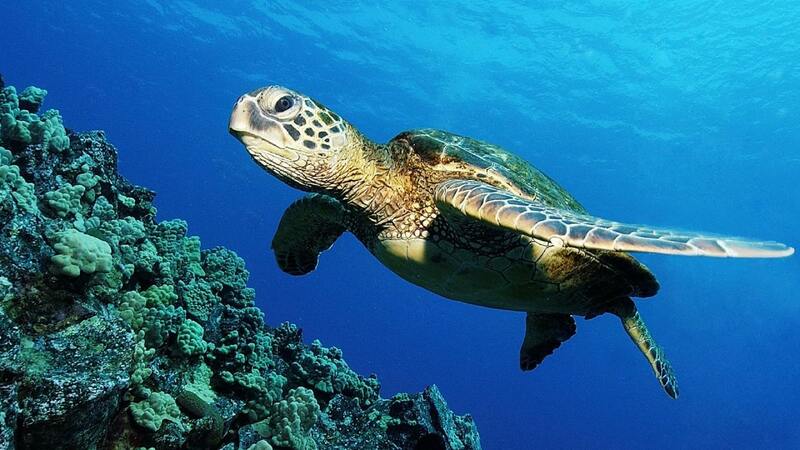 Closer on the continental shelf are found smaller marine animals like turtles, dolphins, porpoises and dugongs. The north Arabian Sea is rich in corals and kelp seaweeds that provide breeding and nursery habitats for Crustaceans like crabs, shrimps and lobsters. The environs of Churna Island are a well-known habitat of these clawed and spiky creatures, as well as many varieties of edible fish. Night dives, part of the advanced diving course, are usually rounded off with seafood barbecue on Sunehra Beach, I was told. Surfacing after the dive, we found that many divers had drifted off because of fast currents. Getting them aboard took quite a while. Many snorkelers could be seen swimming around the island. A boatload of scuba divers went past, and we were dismayed to learn that it was one of more than a dozen unlicensed start-up dive centres that are in operation in Karachi. For safety reasons, there is an urgent need of a proper regulatory and licensing body in Pakistan. For the time being, the only two PADI licensees are Indus Scuba, and Scuba Adventures. PADI is the world’s largest scuba diving outfit, having certified over 25 million divers since its inception in 1966. There are over 6,200 PADI-licensed dive centres and resorts the world over. During my training, I learnt that there was a lot of stress on marine conservation and protection of underwater environments. “Do not touch anything, but photograph everything,” are said to be the watchwords for scuba divers. Unfortunately, protection of underwater environments south of Karachi is terribly lacking. Industrial waste is discharged into the sea without treatment, and except for a couple of multi-national industries, no one seems to care. As a consequence, marine life has been badly hit. The harbour area is a huge toxic dump site for merchant ships, so much so that the water has turned into a horrid sludge, unfit for dipping even an ankle. It is a wonder that industrial divers work in the harbour under such conditions. 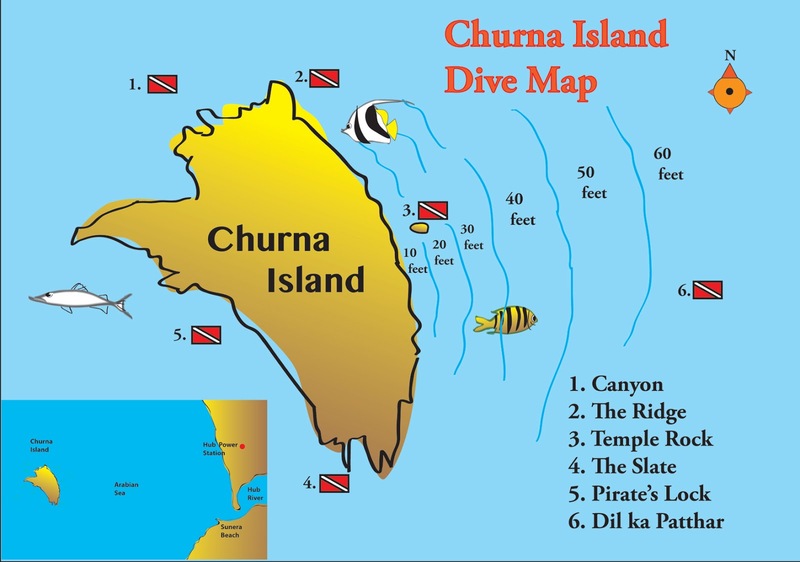 So far, the area around Churna Island has remained pristine for scuba diving. “How much does it cost to qualify as a basic open water diver?” The roundabout answer is that it costs a lot, but still much less in Pakistan than anywhere else in the world. The cost goes up if one plans to buy his/her own equipment. 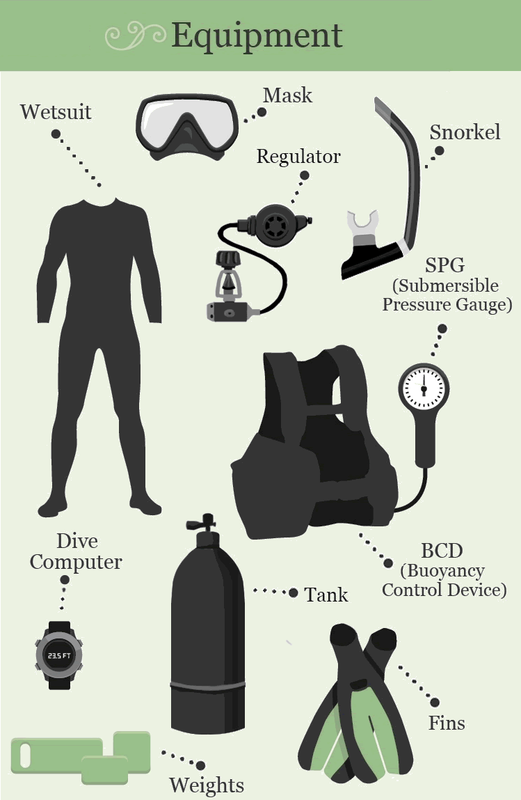 For reasons of hygiene and personal fit, a wetsuit, fins and mask are recommended for purchase, while the rest of the items like the buoyancy jacket, cylinder, regulators, dive computer, etc, are best hired from the dive centre. Once certified, one tends to log more dives for higher qualifications, so the expenditure keeps on spiralling. There are, however, cheaper options of doing a short introductory course with hired equipment, for no other reason than to experience the ‘fourth dimension’, a truly majestic world of exotic flora and fauna that can never be experienced on land. During the diving sessions, I came across gadget geeks who had fancy equipment including underwater cameras, torches, compasses, computers, and large knives wrapped on their legs for easy reach, though mercifully, no shark encounters have ever been reported in our seas! Unable to resist the call of the gizmo geek in me, I have already started a collection of diver’s equipment and tools, that promise to see me through the advanced course, which comes next season. Over the long term, marine archaeology might be an interesting speciality to take up, as Mustafa and I have shared some thoughts about exploring the waterfronts of some ancient coastal sites on the Makran Coast. Who knows with our scuba skills, we might discover some long lost Harappan vessel that ran aground while hauling goods to Mesopotamia! This article was published in the daily newspaper The News International on 23 April 2017. An interesting and informative read,yet very little about the scenes under water perhaps because of less visibility.